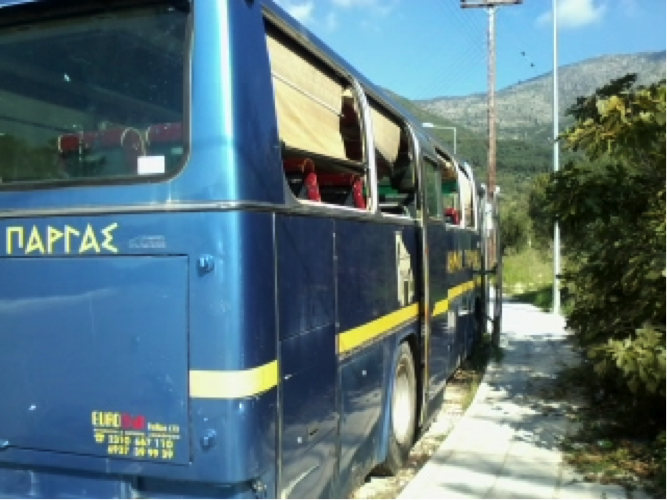 Sharon Endacotte has been on holiday to Greece, where she found some interesting cars, and bikes and buses. I’ve not long got back from my holidays. It’s a long time since I’ve actually managed to go abroad, and for my first foray into foreign climes since the 1990s, I chose Greece as my destination. As the trip grew closer, I got more and more excited, but also a little nervous - would I be nervous on the plane? What would the food be like? Would I be stopped at customs so a man could put his hand up my bottom? The answers, in case you’re wondering, were no, delicious and thankfully not. 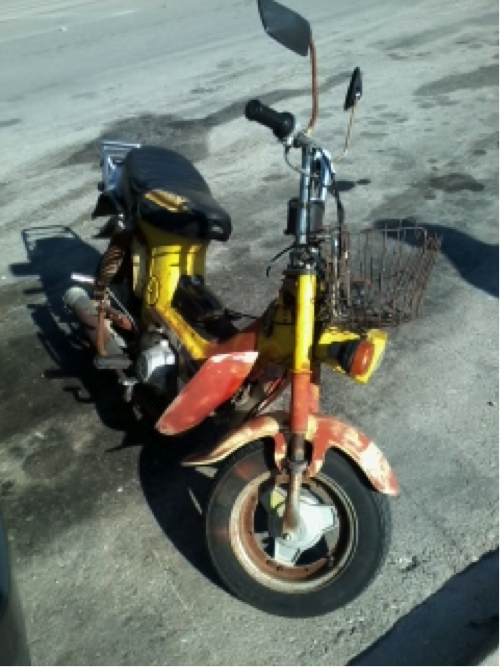 But I think the thing I was most curious about was what I was going to find on the roads. Greece, after all, has been suffering particular hardship during the economic crisis, so I didn’t expect to find the place gridlocked with Lamborghinis. I’d also chosen to stay in a tiny town called Parga, which has a population of not quite 4,000 people and sits nestled within acres of olive groves at the edge of the Ionian Sea. 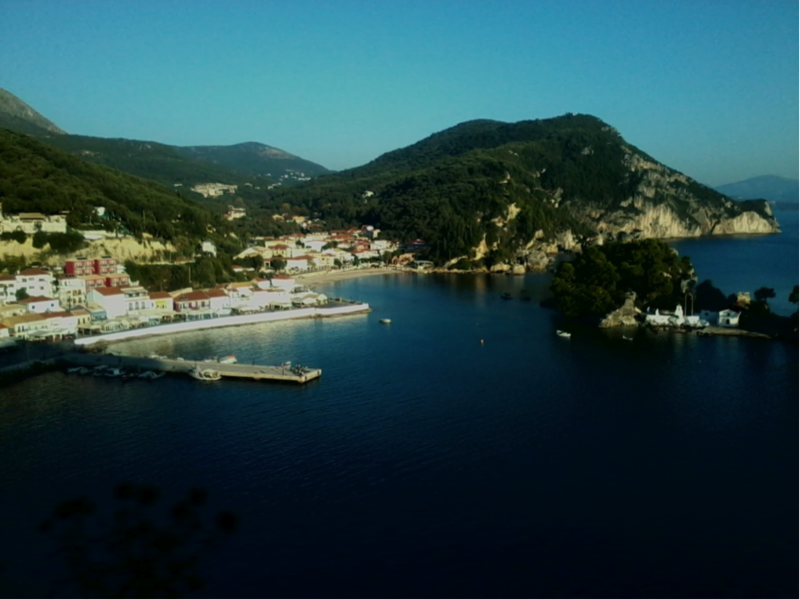 Parga, especially at the quiet end of the season, is devastatingly lovely. The same, it transpires, cannot be said for the vehicles, some of which are almost comically knackered, and seemingly abandoned where they fall when they can no longer keep going. 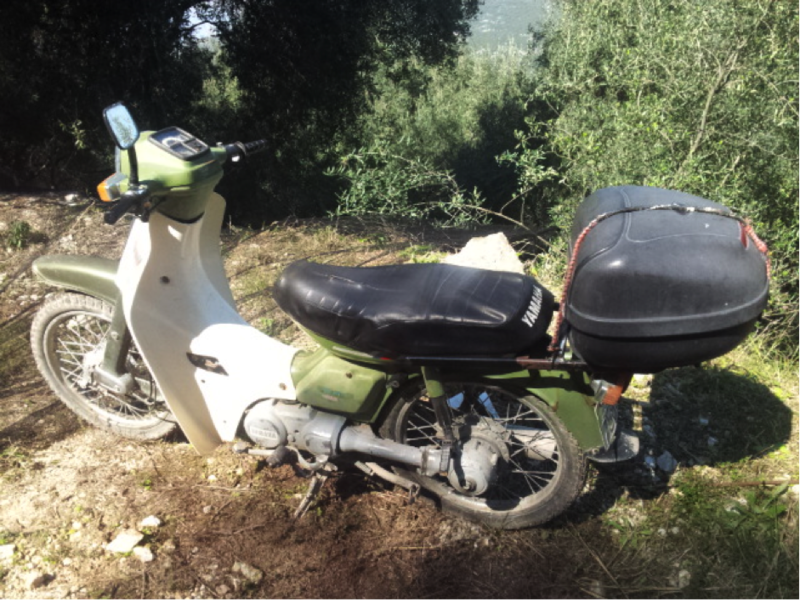 Such a collection of mopeds, scooters, cars and buses is rarely seen here in the UK outside of a scrapyard – and yet in Greece, people cheerfully buzz around on things that look ready to kill them. Several times I saw people on superannuated scooters set off from the top of a hill and not start the engine until they ran out of momentum at the bottom. Fuel is much more expensive than it used to be over there, so for people with Euros in short supply, any trick that helps them travel for less is utilised. 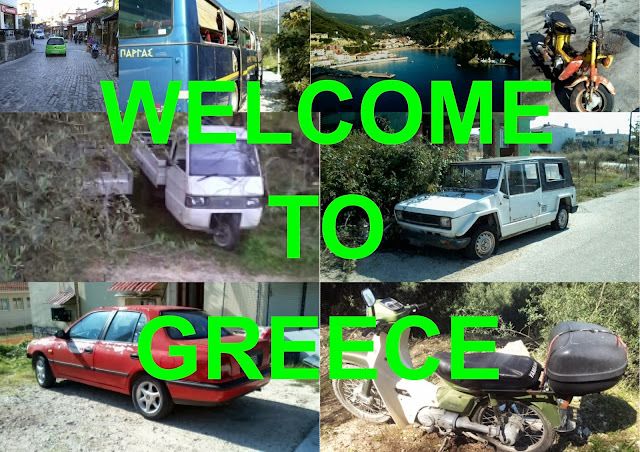 I could try to describe in detail some of the sights I saw, but as a picture paints a thousand words, and words are a much slower way of filling column inches, I will instead bring you a gallery of the delights of the Greek highway. Some are elderly but well loved, like this little Yamaha. Others are more like exhausted, broken down old donkeys – still trying, but there’s not much left to give. This poor old coach has been on its final outing, and left for dead at the bus stop. 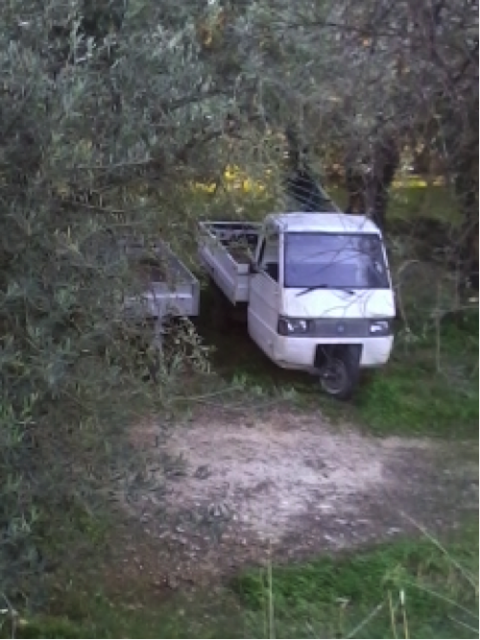 Joking aside, I’m not sure what this old Fiat started life as, but by the time we found it, in a little town near Meteora, it had long since passed on to the Great Scrapyard in the Sky. It had been parked and left, for so long that it had brambles growing through it. It did have an abandonment notice on the windscreen, but nobody had done anything about it. In Parga though, cars were few and far between. Several times I walked along the main road linking Parga to the neighbouring towns and saw maybe a handful of cars the whole time. Most people travel on two wheels, from little old men to mums with their children perched on the bike with them. They duck and weave through streets too narrow for cars and hardly ever bother with leathers or helmets or boots, yet most of the time they manage to get from α to β without dying horribly. It’s not to say that every vehicle on Greek roads is old and potentially lethal even when not involved in an accident, but the newer cars did mostly appear to be of the more affordable type. 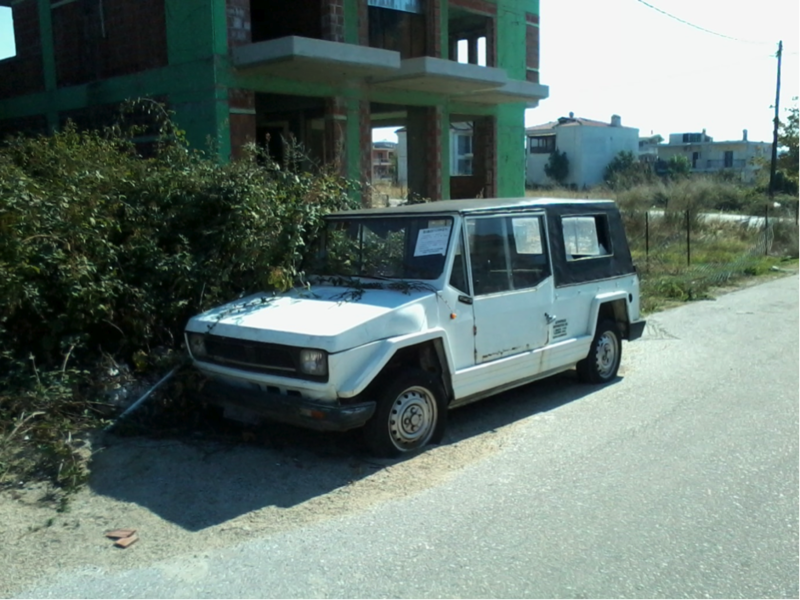 For some reason, the Fiat Panda and the Dacia Duster seem to be quite popular – we saw several of the latter. As for working the olive groves, nothing, it seems, is better than this tuktuk-esque little truck. There are some places where the crisis hasn’t bitten quite so deep, and one of those places is a picture-perfect mountain town called Metsovo. In the winter, believe it or not, it’s a ski resort. Its streets are lined with almost alpine buildings, and many of the residents still wear traditional dress. 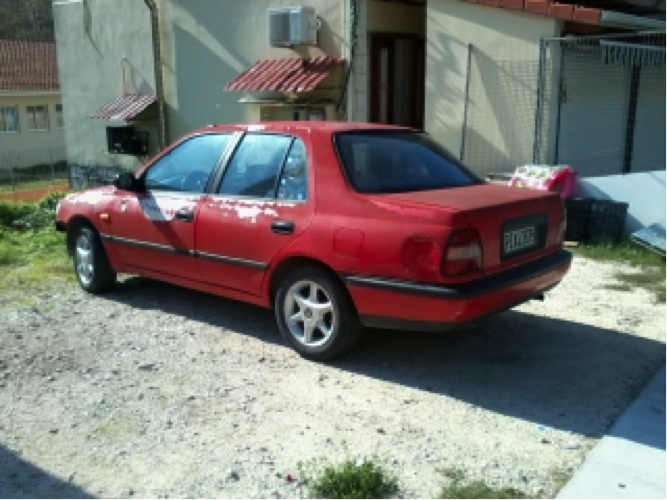 And in the middle of all this quaint architecture and breathtaking scenery, I saw the most hideous pimped-out Opel Corsa it has ever been my misfortune to set eyes on. It was staggeringly noisy, so low to the ground I’m amazed it could cope with the potholes and it was quite the most dayglo of dayglo greens. It looked about as at home as a Buddhist monk at a hog roast. 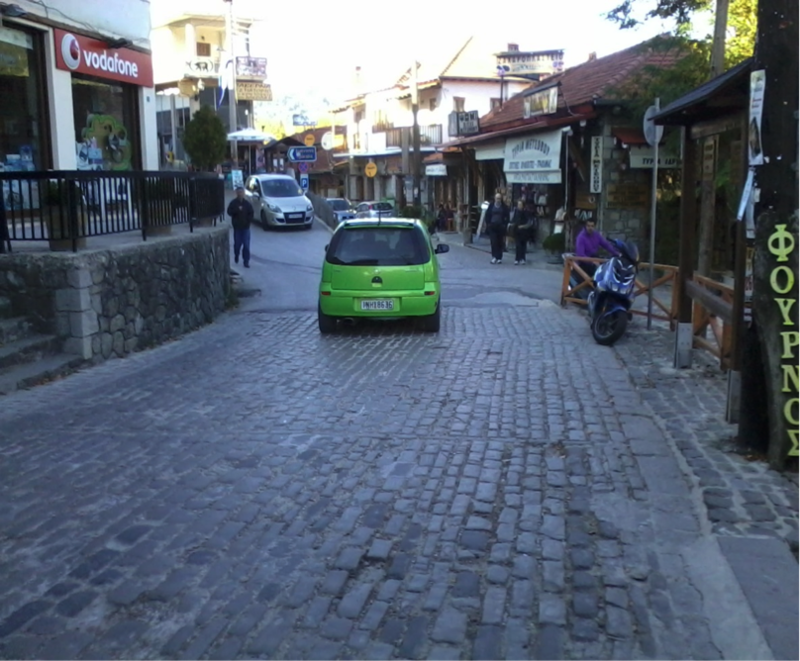 But the character of the vehicles we saw in Parga in some strange way really suited the character of the place. The town and its people are welcoming, happy, relaxed – as long as their vehicles can get them where they’re going, they’re not too worried how they look, or if they work entirely as they were meant to. Life’s too good to fret about things. When you’ve seen a chap of about 75 years old freewheeling down a massive hill on a moped, his head protected by nothing more substantial than a trilby and a big toothless grin on his wizened face, it all somehow makes sense.